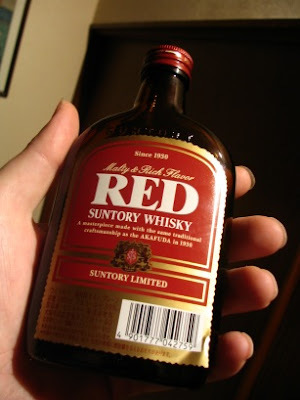 Nonjatta: Red Suntory Whisky - "grain and petrol"
Red Suntory Whisky - "grain and petrol"
Just like the Torys, this is pretty horrible when taken neat - I got the judders just trying to swallow it - but these cheap end Suntorys are not designed for drinking neat. This one traces its lineage back to the "Akafuda" (Red Label) put on the market by Suntory in 1930. It says it was made with "the same traditional craftsmanship as the Akafuda" which tells me two things: 1. The original blend was so foul that they have had to update it for the modern palate. 2. Never trust a label that talks about "traditional craftsmanship". It has the same cloyingness as the neat Torys but this time, instead of a saccharine sweetness, I got a gob-in-your-face, nut-you-in-the-forehead grainy taste with a nasty grain and petrol aftertaste. Couldn`t face anymore of it undiluted. It might taste better with ice. You might be able to convince yourself you are some kind of hard-edged whisky downing beatnik poet or something. I went for the easy option and made it into what it was designed to be drunk as: a mizuwari. I added two measures of water and a glass full of ice and entered it in the Second Mizuwari Death Match Challenge.